There has been an awakening in the Force. Launching on April 11, the War for Iokath update for Star Wars: The Old Republic hopes to entice players back to its battlegrounds. As a new superweapon of unspeakable power is unearthed on the planet of Iokath, players must side with either the Republic or the Empire as the two factions race to capture this deadly device. For more adventures in a galaxy far far away, check out these PC Star Wars games. A planet full of advanced ancient technology, Iokath is no place for padawans so players must be level 70 if they wish to take part in the new content. 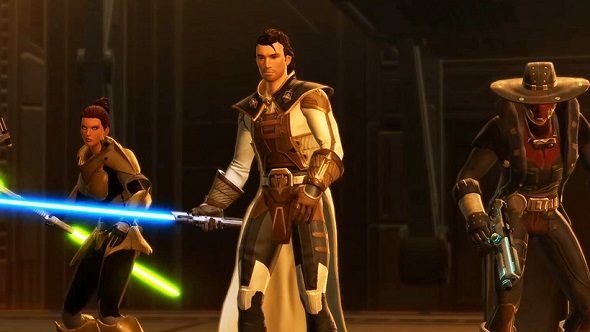 The main storyline will have allies of the Republic meeting up with former companion and Republic Trooper Elara Dorne, while those friendly to the Empire will come across Sith Warrior and ex-compatriot Malavai Quinn. These old partners will fight with you during this new adventure, but expect friendships to be tested as you explore Iokath. The storyline culminates with a new Operation, which sees players fighting against the menacing machine god, Tyth. A hulking metal monstrosity that guards the superweapon, this Operation will be available in both Story and Hard modes, with a super-challenging Master Mode variant coming soon after. Besides the main story content, Iokath is home to a daily arena where players can repeat previous combat missions to unlock new armour, vehicles and even in-game pets. Besides being level 70, players who want to play through this new content must have access to the Knights of the Eternal Throne expansion. If you are a free to play user of SWTOR, this means subscribing for Premium while Premium members should be good to go once the update drops on April 11.